Winter is falling with the first snowflakes, bringing the early morning frost, and the inimitable Christmas windows. We took a walk around our hometown Paris to bring you a curated selection of our favorites so far. We work on material developments throughout the year to bring you cutting-edge materials and update our existing classics, and Christmas is one of our busiest times. This season, among many new developments, we developed the Large-Scale Glitter Projection Printing process that is our TECHNOLOGY story this month, which can be used for many seasonal and non-seasonal applications, take a look here. Morning frost is one of the earliest signs of the arrival of Winter, bringing with it the promise of cozy nights, and hot cocoa in front of an open fire. It was a popular sentiment that ran through requests for Christmas 2018, alongside the more traditional snow effect materials, as people searched for more technical representations of frost. 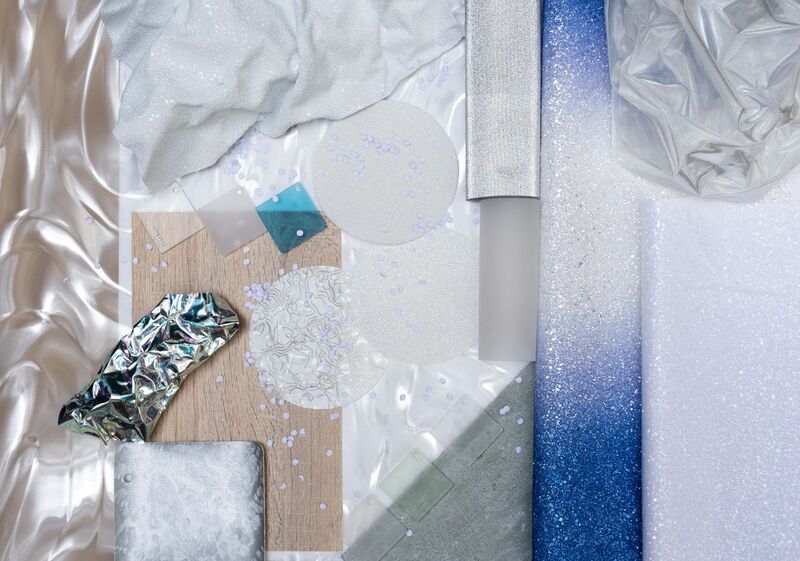 American Supply’s Creative-Techno-Lab worked on mood boards to highlight this trend from January 2018, pinpointing the materials we have that best represented it, and gathering new materials with this in mind. If you would like to inquire into any of these materials and receive samples, please contact us giving the material reference, or feel free to browse MATERIALS for a curated selection of some of our favorites.